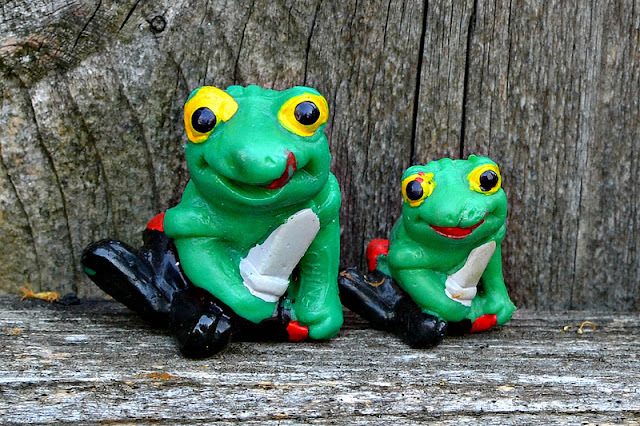 Little Weirdos: Mini figures and other monster toys: Frog warriors...more of them! They're baaaaack! 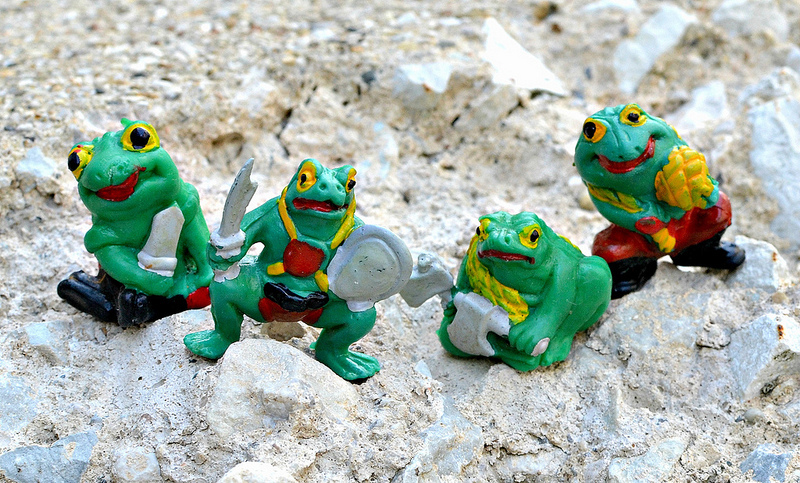 Say hello again to some greatest/most atrocious cheapo mini figures ever...rubber frog warriors! 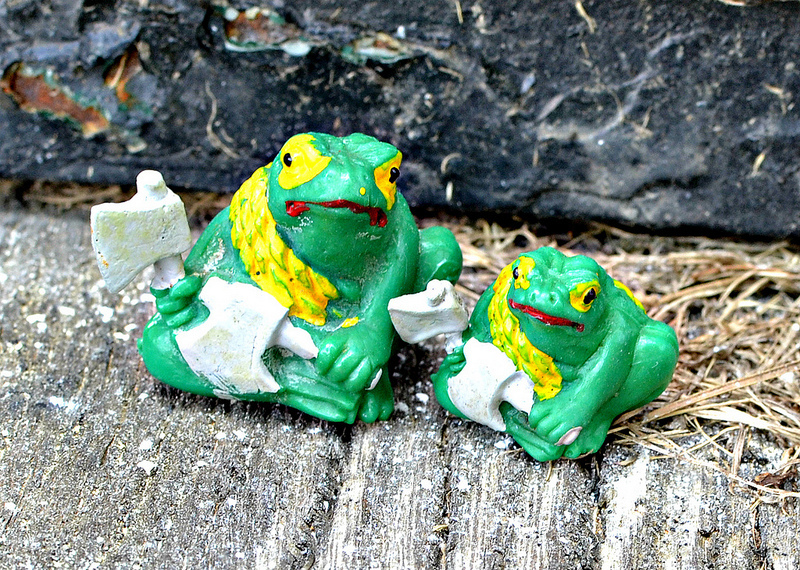 One of the first posts I made on this site showed the two frog warriors that I've had for years and years. They were quite lonely, at one point having more frog warrior buddies but losing them somewhere along the way. But they're happier now because thanks to a fellow collector kindly sending some along with some other figures I bought, they're now a much healthier group of six. Not only do I now have two more sculpts different from the ones I've always had, I now have two of the sculpts in larger sizes. I never knew these existed in larger sizes, but there you go. Man, these things look so sad and awful, which of course means I love them. Their paint applications are garish and sloppy; take a look at the larger-sized figure in the bottom photo--it looks like it's either been experimenting with lipstick in the dark or is bleeding from the sides of its mouth. And while I believe they're based on Bullywug characters from Dungeons & Dragons, which are supposed to be nasty creatures, a couple of these guys were sculpted to look goofily happy and oddly cute (which, considering the fact that they're wielding knives and axes, makes absolutely no sense). I'll always have a soft spot for these little weirdos. I know there's at least two more sculpts that I don't yet have, so hopefully soon I'll be able to complete the set. I like them.They remind me of the bullywogs from Dungeons and dragons. You know where I can get any. I obtained 2 from a friend last night. I would like to collect them. They look great next to my soma ninjas and soma karate guys. Unfortunately I don't know of any place where you can buy them right now, but I do see them turn up on eBay from time to time so I'd keep an eye out there.